I always cycled as a kid, as it was the only way to get around before I had access to a car. That stopped after I left university until I bought a bike to cycle round the canal towpaths in Birmingham where I was working. Eventually in 1999 I rode down to London on the canal towpath. I wouldn't recommend it, it's rather bumpy! But it did give me a taste for cycling and I decided to commute to work in London - more because it was actually quicker and more reliable than getting a bus and tube. 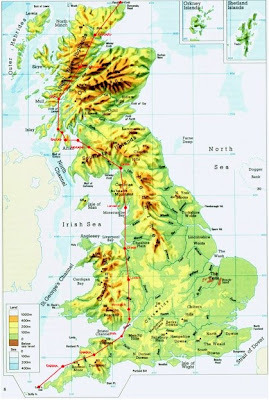 So when a colleague at Channel 4 set off on a round Britain ride, it started me thinking about cycling from Land's End to John O'Groats - one of those classic routes you hear about people doing for charity. After quizzing my friend on his tips, buying a book with routes and tips, and poring over maps of Britain, I decided to take the plunge. The world record for the route (which comes in at around 950 miles, depending on which way you go) is under 2 days. For goodness sake, the record on a Penny Farthing is 5 days and 10 hours! I won't be challenging that - my route will take 14 days, averaging around 70 miles per day. I didn't initially have the idea of doing the ride for charity, but my wife Clare persuaded me that I should use the opportunity to raise some money, so I'm doing the ride for Multiple Sclerosis and Motor Neurone Disease.